My contractor finished the ventilation system today. 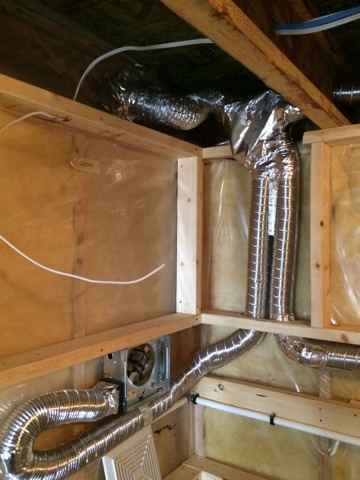 Ventilation consists of 3, 50cfm bathroom fans that exhaust to the outside. Two fans live on the edges of the sink at a low height. And one lives in the ceiling. That way some hot air can get evacuated too. Coming up with an adequate cfm number for the fans is an interesting endeavour. Kodak says 15 air changes per hour. But according to the numbers on http://sebastiandarkroom.com/darkroom_design.php it's a little less. A quick calculation tells me the darkroom is roughly upwards of 1900 cubic feet with a 250 sq ft footprint. Doing the cfm calculation using that data using the info on the Sebastian Darkroom site tells me that I need 125cfm minimum. So 150 is more than enough. Let's hope these things aren't too loud. 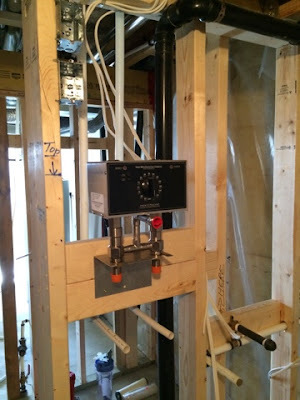 We are also getting closer to hooking up the water panel. 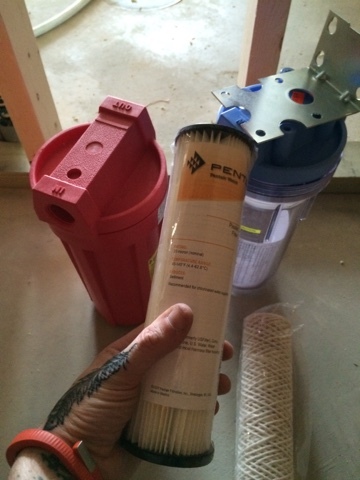 Filtration is ready to be put in. And then it's a matter of hooking up the water. First code inspection will happen on Friday! We are inching closer. The ventilation system in place. 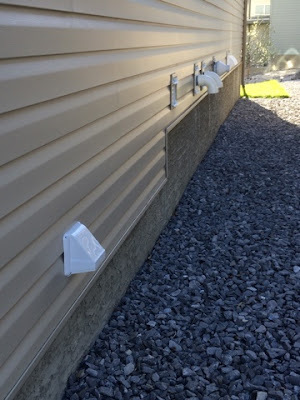 The collector and vent to the outside. 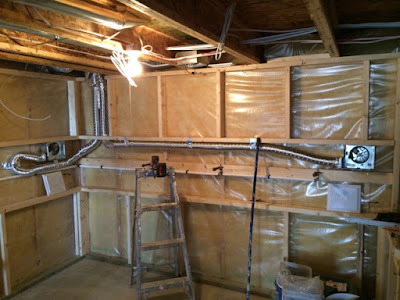 Water panel and water mains. The water filtration with 25micron filters on both hot and cold water inlets. An extra vent on the outside of the house in the foreground.